Three historic events that put Sarajevo in the history books are: The assasination of Ferdinand and the start of World War I, the winter Olympic games of 1984, and the shelling of the city in the ethnic conflict of the Yugoslav war. Earliest history of the Sarajevo valley dates back to the neolithic when it was the craddle of the so called Butmir culture, a neolithic society named after the finds in Butmir nearby Sarajevo. It is also known that the Illyrians had several settlements in the valley. Illyrians were the indiginous tribes that lived on the western part of the Balkan peninsula. During Roman times, after the conquest of the Illyrians, a town named Aquae Sulphurae ("sulfuric thermal spring") was known to exist in the place of Ilidža, one of todays suburbs of Sarajevo. After the Romans, the Goths settled the area and after them in the 7th century came the Slavs. The settlement Vrh-Bosna existed in the Sarajevo valley as a Slavic citadel from 1263 until it was conquered by the Ottoman empire in 1429. However it was not before the 1461 that the settlement was established as a city, named Bosna-Saraj, around the citadel. The city was founded by Isa-Beg Isaković, the first governor of Bosnia. The name Sarajevo is derived from Turkish saray ovası, meaning "the field around saray" (Saray is a Turkic word of Persian origin which means 'palace'). The Ottomans ruled Bosnia for five centuries and Sarajevo grew to develop as an important cultural and trade centre of the region. Although Isa-Beg Isaković was the one who founded Sarajevo, his succedor as the governor of Bosnia, Gazi Husrev-beg was the one who made it what it is today. He was responsible for the construction of the famous Gazi Husrev-beg's Mosque, the Tsar's Mosque, and numerous other mosques throughout the city. He also constructed the first Sarajevo library, madrassa, school of Sufi philosophy, and clock tower (Sahat Kula), along with numerous other important cultural structures. The body of Gazi Husrev-beg remains to this day in a tomb in the courtyard of his mosque. The tomb bears an inscription: "May the mercy and generosity of god fall upon him every day". Many even today visit the tomb to give prayer each day. After the long period of Ottoman rule, Austro-Hungarian empire acquired Bosnia (1878-1918) and it was during this rule that many buildings In Sarajevo were built in a recognisable "Austrian manner". This is what gave Sarajevo its specific European flavour. Moreover Sarajevo was industrialized by Austria-Hungary, who used the city as a testing area for new inventions, such as electric tramways (1885), before installing them in Vienna. When the First World War ended Austrian crown province Bosnia and Herzegovina, found itself in the Kingdom of Serbs, Croats, and Slovenes later renamed in the Kingdom of Yugoslavia. In 1941 the Nazi Germany invaded Yugoslavia and Sarajevo was bombarded. Yugoslav Partisan resistance fighters, led by Josip Broz Tito, liberated Sarajevo on 6 April 1945 and Sarajevo has become an important regional center of a newly formed Yugoslavia. In 1992 as as the former communist state of Yugoslavia was disintegrating, Sarajevo was surrounded by the "Jugoslovenska Narodna Armija" (Yugoslav National Army) and a number of paramilitary (Bosnian Serb Army) formations. The siege of Sarajevo and the war in Bosnia and Herzegovina resulted in many deaths, large scale destruction, and dramatic population shifts. As soon as the war ended with the Dayton Agreement of November 1995 the slow healling process started. 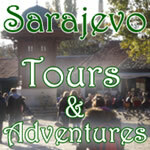 Today, once again, Sarajevo is able to welcome you and present you with its wonderful attractions and beauty uncompared.